During my European travels last year, I sampled a heavenly brew called Vergött White IPA, brewed by Birrificio Artigianale Lariano of Dolzago, Italy. It was my first time encountering a White IPA, which is essentially a Belgian wit ramped up with hops. In my memory, the brew was crisp, tart, and citrusy–a really fun combination of flavors and aromas. Upon my return to the United States, a little more research turned up additional information on this burgeoning style. I tracked down some bottles of Deschutes Chainbreaker White IPA, which was good, but just a little heavier and sweeter than my own tastes and as compared to my memories of the Italian beer. So, I set off to create a new recipe that would bring together the best of all worlds. I have no idea how it will turn out, and I suspect it may get iterated through a few batches. This was the first batch where I used yeast cultured on my new stir plate. The yeast was culturing for around 24 hours when I pitched it, looking to be at high krausen. Also, it was my first time working with pilsner malt. 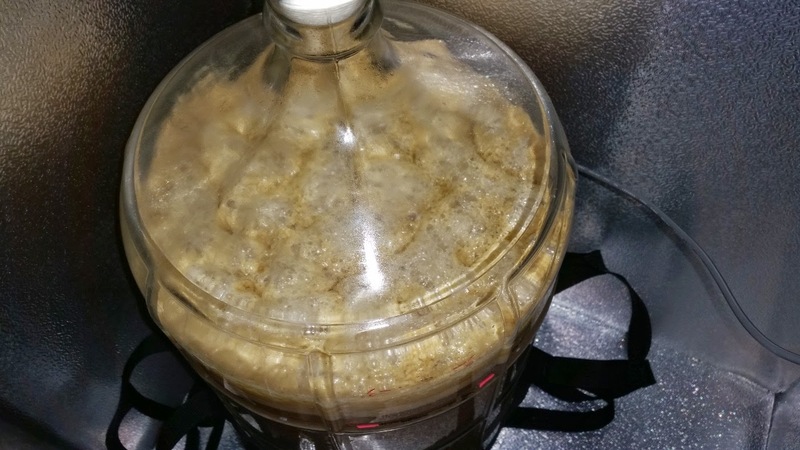 Per my usual custom, I am naming this IPA after a supercontinent–Pannotia this time around. I mashed in with 3.5 gallons of water at 159°. The mash stabilized at ~147° within 5 minutes, which was a little on the cool side for my taste. So, I added 1 gallon of ~185° water, stirred it a bit, and got the mash to 151° within a minute. The mash still measured 151° after 10 minutes and 149° after 40 minutes. I drained the mash tun, collecting ~3 gallons of wort with a gravity of 1.064. The hops were in the kettle starting at this point. Note that I adjusted the alpha acid for the calculations based on the age of the hops, using the hops aging tool in BeerSmith. For mash-out, I added 3.5 gallons of water at ~185°. All told, I collected 7 gallons of wort with a gravity of 1.045. This works out to ~74% efficiency. I added the gypsum and brought the wort to a boil. Because I used pilsner malt, which is supposed to have a higher susceptibility to DMS production, I boiled for a total of 90 minutes. One minute before flame-out, I added the coriander and bitter orange peel. At flame-out, I added the Citra hops pellets (contained in a mesh bag) as well as the whole Cascade hops. I cooled the wort down to ~70°, transfered to the carboy (aerating with the Venturi pump along the way), and pitched the yeast (starter and all). This beer was brewed on Monday, April 6, 2015. Starting gravity was 1.057, just a touch below my predicted gravity (1.059). This is likely due to a slightly lower boil-off rate. Total volume was 5.25 gallons. I placed the carboy in my fermenting chamber, and set the temperature controller for 70°. In less than 12 hours, the fermentation was proceeding quite vigorously. Score one for using a starter! This entry was posted in India Pale Ale, white IPA and tagged Pannotia White IPA, PWIPA. Bookmark the permalink.